While at times I enjoyed watching Rocco's Dinner Party, there were many occasions when I found myself watching the clock, instead. Overall, the show was a good idea, with fine production values (although that loft set was plug-ugly), but the repetitiveness grew tiresome after several weeks. 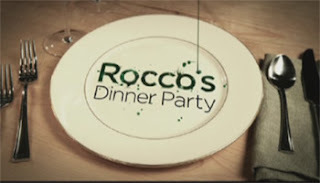 Should the powers that be at Bravo decide that Rocco's Dinner Party deserves a second season, I have some suggestions to improve the show. Ten episodes is far too many; six or eight would be plenty. Invite interesting guests. The general viewing public (like me, for instance) doesn't care about furniture salesmen or New York celebrities. If you must include relative nobodies, then at least make them Bravolebrities. Face it - most viewers will probably also be watching other shows on Bravo and be familiar with their casts. A couple of Top Chefs, Kathy Griffin, Jeff Lewis, that loudmouth Matchmaker chick, and a "prostitution who-ah" or two would spice things up considerably. Not to mention well-known actors and singers. Tell Rocco to be less imperious. If he's such a great and powerful chef, why the hell isn't he in the kitchen? 7. Put the losing chef in cement overshoes and toss him in the East River. Hey Bravo - are you listening?